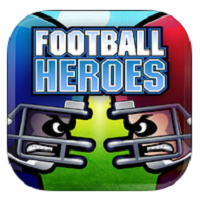 Football Heroes is an arcade style game that was specially developed for use on touchscreen devices like the iPhone and iPad. Unlike simulated football which is hard to play, developer Run Games has made this easier to learn with modern controls, making it a good choice for casual gamers. Football Heroes game controls are easy to pick up and they are perfect for touch screens. You also have several options as far as gaming is concerned; with single player and multiplayer available. Single player is a great way to learn Football Heroes and at the same time try to capture that elusive Cup Trophy. Now if you want to play with your friends, there’s multiplayer mode which you can access via Bluetooth or Wi-Fi. Football Heroes is also customizable, and you can build your own team leading them to victory. The gameplay is very engaging thanks to the graphics, and there are also special moves you can try to give your team the edge. These special moves include the Dragon Punch, Spinning Fists, Time Bomb, Teleport and many others. You also control all the moves like tackling, throwing, running, and passing. The game really has a lot going for it, with the crisp and smooth movements and the top of the notch action. The special moves in particular add a nice touch to Football Heroes, and the characters have distinct personalities as well. In other words, this isn’t your typical football sim, but it’s a lot of fun.